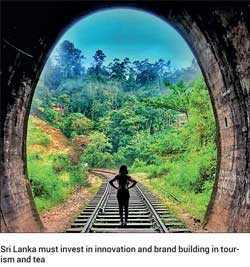 Home / Columnists/ Ceylon Tea or Sri Lanka Tourism the stronger category brand? The Central Bank officially reported last week that Sri Lanka exports have grown to $ 11.9 billion, recording a growth of 4.7%, which means that the country has not performed up to expectation in 2018. The export volume index has grown by 0.5% in 2018 whilst the export unit value index increased by 4.1% which is way below the South Asian region performance. The report went on to state that the overall 4.7% export growth has been driven by higher prices rather than volume, which does not augur well for a progressive government that is in power. If we analyse the performance of Sri Lanka as a nation brand, in 2017 it registered a $ 77 billion performance with Sri Lanka ranked 59th in the world ahead of Algeria and Ukraine which were at 60 and 61 respectively. However in the 2018 Brand Finance report, we see that Sri Lanka has moved up marginally by 7.7% to $ 83 billion and ranked 61 globally whilst Algeria and Ukraine have grown by 27.1% and 23.5% to be ranked 58 and 60 respectively, beating Sri Lanka. In simple words it tells us that the pace at which Sri Lanka is performing is below the global industry average and hence the world is passing us by. In this backdrop the question is, should Sri Lanka sort out the issues in the tea industry as a priority such as the requested wage hike and the overall export thrust globally not forgetting the senility of the tea bushes which will require an aggressive replanting program? The other strategy that the country can focus on is the tourism industry which is also challenged with attracting quality guests into the country and ensuring the country is safe for travel. Tea industry – losing equity? If we do a deep dive on Ceylon Tea, the tea industry with strong leadership has become the first ozone-friendly certified tea producing nation of the world. Starting from the times that the plantation industry was nationalised in the 1970s to when it came under Government control, it went on in the 1980s to make a bold decision to make the Colombo Auction control the global demand chain by breaking away from the great London Auction system which has held ground for many years. The Colombo Auction commands the highest values for tea globally and is in fact the best auction system in the world. In 1990 the supply chain was privatised to management companies which gave the opportunity for new thinking to be introduced to the industry with strong R&D power and capital infusion that resulted in Sri Lanka demonstrating the best performing country globally for value addition tea at a commanding 43% which again was a strong move by the industry. Today, we see that Ceylon Tea has taken the high ground with some focused decisions on conforming to global standards on MRL levels and has gone further by developing a new standard for tea that has resulted in Ceylon Tea being the first certified ozone friendly tea globally that no other tea producer has received. However, if we examine the export performance we don’t see the same aggressiveness. If we analyse the data for the last 50 years we see that Sri Lanka’s performance in the basics of business segmentation and targeting has been very poor. As per table 1, we see that every 15 years the top 10 export markets keep changing which means that Sri Lanka’s equity in the market for ‘Ceylon Tea’ does not gain traction. In 1960 it was the UK, Australia, the US, Iraq, South Africa, Canada and New Zealand. In 1985 (15 years after), Egypt, Syria, Saudi Arabia and Russia came into the key export markets which meant a new set of customers. Once again after 25 years if we analyse the data we see Russia, the UAE, Iran, Turkey, Jordan and Kuwait have come into targeted markets for Ceylon Tea which means once again a new set of customers. Just six years after Azerbaijan and China is in the top 10 markets but the good news is that the top five markets have been stable, which is good news for Sri Lanka. On the other hand if we examine the brand equity dimensions like from awareness to intention to visit as per table 2, we see that the overall health is not very strong. Given the absence of a national marketing campaign to drive awareness and generate a top of the mind push to attract top quality visitors, the overall awareness is low across all key markets. However when the ‘product’ details are explained, the intention to visit score is propelled by almost four times which explains the need for a strong communication campaign. Whilst there have been many attempts to develop and launch a fully-fledged campaign like the Maldives, Thailand and Malaysia, the reality has been it has not happened. Whilst one can debate whether tourism or tea is better for the country to generate a stronger brand name, if one digs deeper to the overall export strategy of Sri Lanka what we see is that the exports of machinery and electrical exports account for only 8% of the export basket whilst competition countries average between 30-45% which one of the key issues the country must address. The last national new product developed for tourism has been the Pinnawala Elephant Orphanage. The Centre for International Development at Harvard University reveals that almost 76% of the products that Sri Lanka exports fall into the lowest GDP growth range as against Vietnam at 34% and Thailand at just 23% which is why such countries are called industrial-driven countries as per the graph. If one analyses the export basket in terms of complexity of the products we export, almost 76% of the products fall into the ‘Low Knowhow’ segment, which means that we cannot ask a premium price. Hence unless we as a nation address this key issue, both category brands cannot unearth their true potential.